European ministers and tech experts have gathered in Helsinki for the Artificial Intelligence (AI) Forum 2018 to discuss the global race for AI, algorithmic transparency and the need to ‘reskill’ the European workforce. The AI Forum 2018 is a ministerial conference on AI which brings together ministers, political leaders from 22 countries, policy makers, experts and industry to establish a shared European vision for the development of AI across member states to ensure that union remains competitive in the age of artificial intelligence. The conference stressed the economic and societal benefits expected from AI. Experts estimated that in the next decade, the technology will create between £3tn and £5tn in value annually. And, by 2030, AI will contribute up to £13tn to the global economy, and boost local economies by up to 30%. Following Lintilä’s opening remarks, the European Commissioner for Digital Economy and Society Mariya Gabriel gave a keynote address which emphasized the commitment of the EU to remain at the forefront of AI-deployment to create growth and competitiveness in Europe. Gabriel said, “We need to invest 20 billion euro per year for the next 20 years” for the race on AI. During the conference, I asked Commissioner Gabriel what she thought were the obstacles for the development of AI in the EU. She replied that the major obstacles to AI were the lack of coordination and share of resources between member states, shortage of digital skills and the absence of a clear set of ethical guidance. She said that every obstacles can be transformed in opportunity, and listed some EU initiatives that can help tackle these obstacles. Gabriel called for better coordination between member states and the EU institutions, and welcomed the upcoming Finnish National Strategy for AI. Indeed, the work on a national AI Programme for Finland has been at full speed for over a year now and the strategic measures have been implemented for the last eight months. Discussing the need to pull together digital resources, Gabriel announced the Commission’s intention to launch an AI on Demand platform in January 2019 to boost advancement of the new technology within Europe. The £17.5m (€20m) initiative aims to mobilise the European AI community in order to combine efforts, to develop synergies among all the existing stakeholders. To address the shortage of 350.000 digital specialist in Europe, she said the Commission will launch a Digital Opportunity Traineeship in June to offer to up to 6,000 European students the possibility to make paid internship in member states. During the press conference, Gabriel also welcomed the European Parliament’s backing of the new Copyright Directive, saying that the new regulation will bring tangible benefits for EU citizens, researchers, educators, writers, artists, press and cultural heritage institutions and will open up the potential for more creativity and content by clarifying the rules and making them fit for the digital world. You can watch the video of the panel discussions of the AI Forum 2018 on AI Finland website. 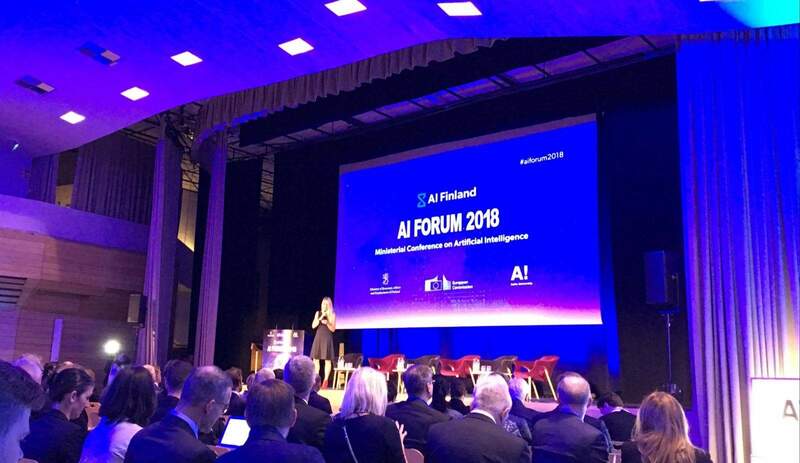 I will shortly publish a detailed article on the AI media tour I had the chance to attend while in Finland that will include an overview of Finnish solutions and policies regarding AI and the broader European framework.